This 1917 Crocker fountain pen (#263) uses the unusual “hatchet-filler” mechanism. Crocker was founded in the late 1890s by Seth Crocker, who then went on to start the Chilton Pen Company. 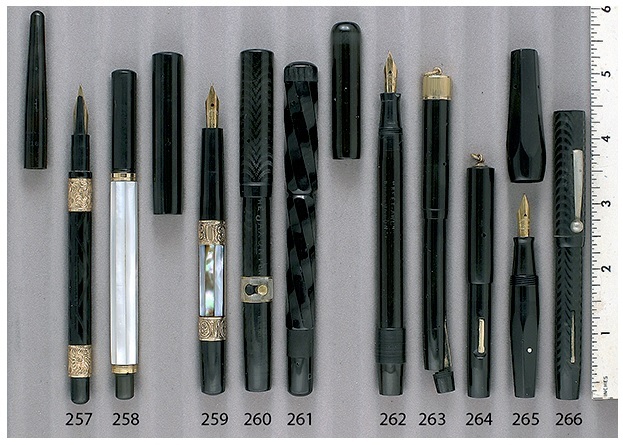 This is a black hard rubber ring-top model with a gold-filled knurled cap top and an extra-fine/fine flexible nib. This Crocker Boston #3 is in near mint condition! (Still available!). The Crocker is a wonderful vintage pen. The hatchet-filler came in 1913, after the “blow-filler.” The blow filler has an ink sac inside the barrel and a small hole at or near the end of the barrel. The nib is placed in ink and, to compress and empty the sac, one blows into the hole (applying pneumatic pressure to evacuate the sac). Once the air pressure is released, the sac expands, equalizing the air pressure to its surroundings, while drawing ink into the sac. The hatchet-filler was sold along with the blow-filler and eyedropper-filler. At the end of the hatchet-filler barrel, there is a hinged blind cap with a lever attached. To operate, the blind cap is lifted up from the barrel, operating the lever which evacuates the bladder. For most fountain pen users, this is preferred to the blow-fillers (and much more sanitary!). Crocker sold all their patents and trademarks to Nicholas Zaino in the late 1920s. This entry was posted in Vintage Pens and tagged Crocker, Fountain Pens, Go Pens, GoPens, Vintage Fountain Pen, Vintage Fountain Pens, Vintage Pen, Vintage Pens. Bookmark the permalink. Follow any comments here with the RSS feed for this post. Post a comment or leave a trackback: Trackback URL.